This is plate 19 from James Baillie Fraser's 'Views of Calcutta and its Environs'. Fraser (1783-1856) arrived in Calcutta in 1814 and in six years produced these animated sketches of the busy city of Calcutta, published later as a collection of 24 superbly aquatinted plates. 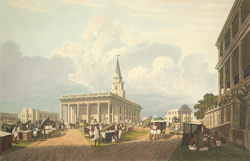 St John's cathedral, built in 1787, was designed by Lieutenant James Agg of the Bengal Engineers and based on the design of St Martin-in-the-Fields in London. A ramp had been built by the side of the Cathedral to allow easy access for palanquins. To the right of the cathedral is the monument to the Rohilla campaign of 1794.